Find the perfect addition to your photography and video equipment in the SanDisk 64GB SDXC Flash Memory Card. It gives you plenty of space for all your tunes, TV shows, video clips, and more. The card is perfect for moving files between computers, cameras, and other gadgets. This card has a blank writeable space on the front of the card that makes it easy for you identify different cards. This card is tested to work under harsh conditions. It is waterproof, temperature proof, shock proof, vibration proof & x-ray proof. 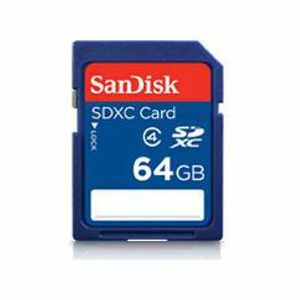 Go ahead and buy the SanDisk 64GB SDXC Flash Memory Card now!